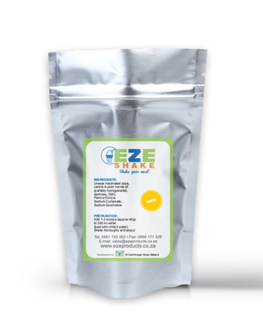 EZE Shake can be used as a meal replacer or to drink between meals. The product is a combination between proteins, carbohydrates, good cholesterol-free plant fats and plant fibres. 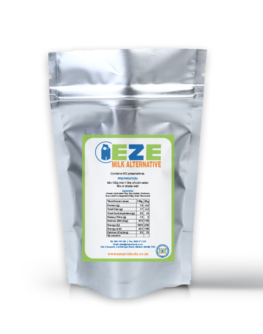 EZE Shake can be used to assist in weight management. EZE Shake is easy and safe to use. EZE Shake is a good nutritious substitute for a meal. EZE Shake will help you lose or maintain weight, in a healthy way. EZE Shake is not heavy on your kidneys. 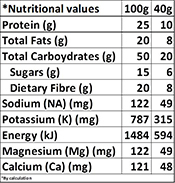 Add 80g (adult males) or 40g (adult females) to 600ml or 300ml and shake well. Drink 3x300ml per day (morning, afternoon and evening) and enjoy fruit and biltong as snacks. Eat breakfast of your choice, drink EZE-Shake @ 10h00 and @ 16h00. Eat a small meal for supper, don’t eat too much carbs in the evening. 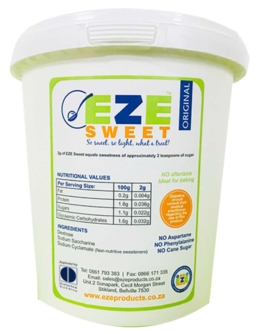 Drink EZE-Shake for breakfast, eat a healthy lunch and then drink an EZE-Shake for supper. (This one is the most popular). Only use EZE-Shake meal choices for 5 days and eat normal on Saturday’s and Sunday’s. Please ensure you drink enough water during the day. Remember, everyone’s body is different, so listen to your body. Urease inactivated soya, Vegetable Fat (palm fruit), Dextrose, CMC, Cocoa Powder, Sodium Cyclamate, Sodium Saccharine.